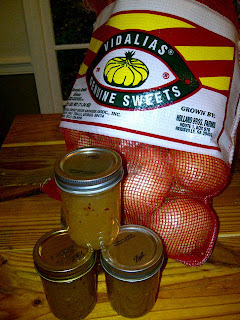 Last week I came into a bushel of Vidalia onions. My father-in-law came back from his annual trip to the beach with bags and bags of these "straight out of the dirt" onions. It was pretty exciting...it has also been pretty intimidating to have 50 pounds of onions in your kitchen with nary an idea of what to do with them. I've imagined bottling my own salad dressings, chopping and freezing some of them, but when I had serious questions of preservation, I went straight to the horse's mouth. Puree the onion and vinegar in the blender until smooth. Pour into a saucepan. Add the sugar and red pepper flakes. Bring to a boil over medium-high heat. Boil for 5 minutes and then add the pectin. Bring to a hard boil for 1 minute. Pour into hot, sterilized jars. Secure the lids and process in a boiling water bath for 10 minutes. Some notes about this: First of all, I chose to use my food processor for the whole chopping/pureeing process which worked fine. I then added all other ingredients in the pot. I wasn't happy with the color with only 6 minutes of cooking time. It seemed sort of like white mush with red flaking. I cooked the entire mixture a bit longer--probably 10-15 minutes to bring a more caramelized color. It also allowed some of the red pepper flavor to infuse a bit more. I added a bit more cider vinegar, red pepper flakes, and probably ended up using 3 cups of sugar. I got 5 half pint jars of the jelly with a little left over to sample. I processed them for 15 minutes just to be on the safe side. This recipe turned out really well, and I'm looking forward to experimenting with other ways to save the Vidalia onion season.